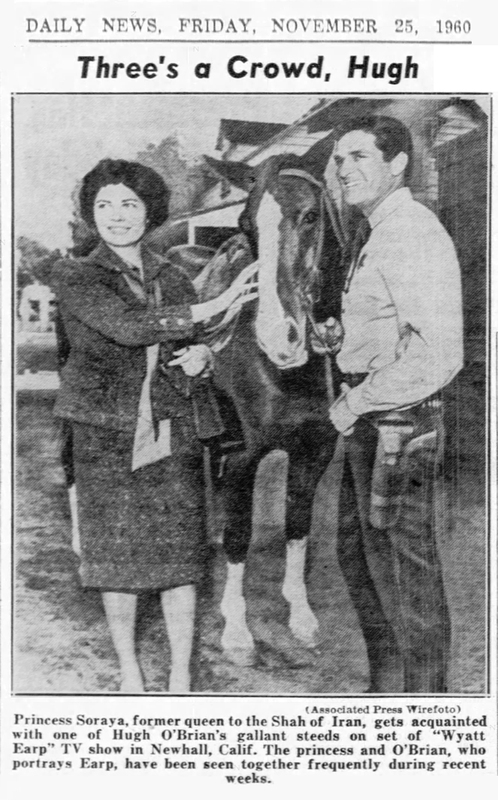 SCVHistory.com LW3401 | Placerita Canyon | Ex-Queen of Iran, Hugh O'Brian, Champion at Melody Ranch, 1960. November 24, 1960 — Actor Hugh O'Brian brings his date, the ex-Mrs. Shah of Iran, to Gene Autry's Melody Ranch studio in Placerita Canyon where O'Brian was currently starring in the long-running TV series, "The Life and Legend of Wyatt Earp." (Then as now, most shows didn't survive six seasons.) 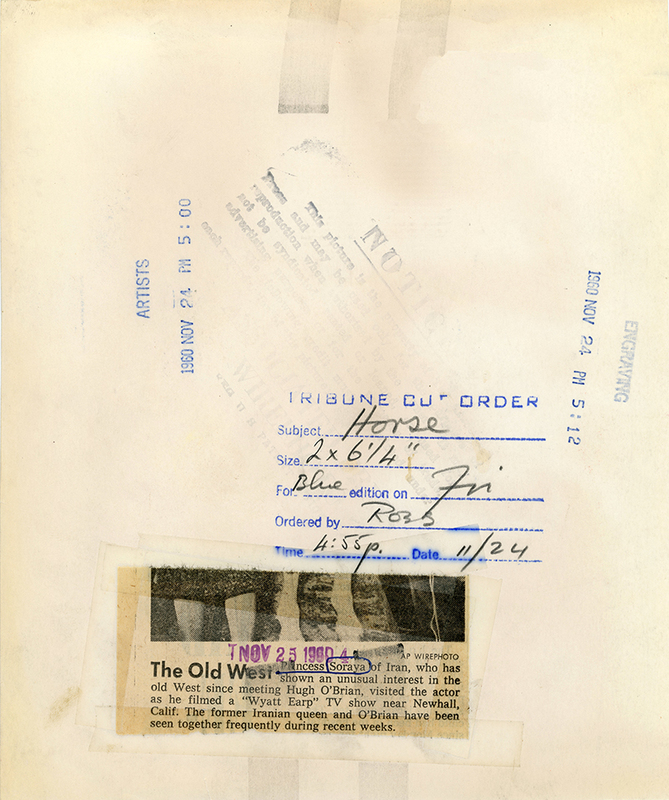 The newspapers apparently didn't feel a need to identify the horse; readers would know it's Autry's famous mount, Champion. 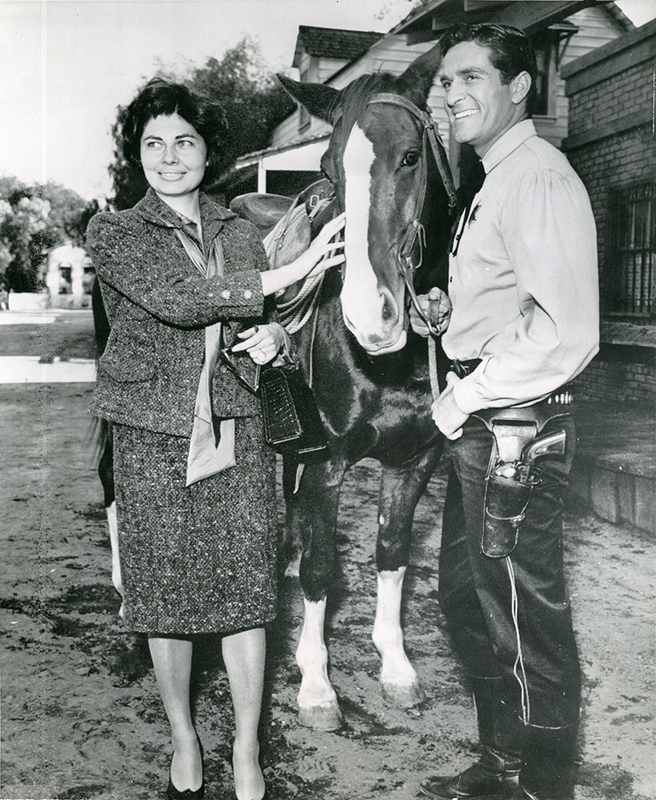 Princess [sic] Soraya of Iran, who has shown an unusual interest in the old West since meeting Hugh O'Brian, visited the actor as he filmed a "Wyatt Earp" TV show near Newhall, Calif. The former Iranian queen and O'Brian have been seen together frequently during recent weeks. Soraya Esfandiary-Bakhtiary was born in Germany in 1932 to a Persian father (Iran's ambassador to West Germany) and a German Catholic mother. Soraya was neither Muslim nor Catholic. She would become the second wife of Shah Mohammad Reza Pahlavi (1919-1980), and as such, queen consort of Iran. Shah Pahlavi came to power in 1941 upon the abdication of his father, Reza Shah. Pahlavi needed a male heir before he could be crowned King of Kings (Shahanshah), aka Emperor of Iran. 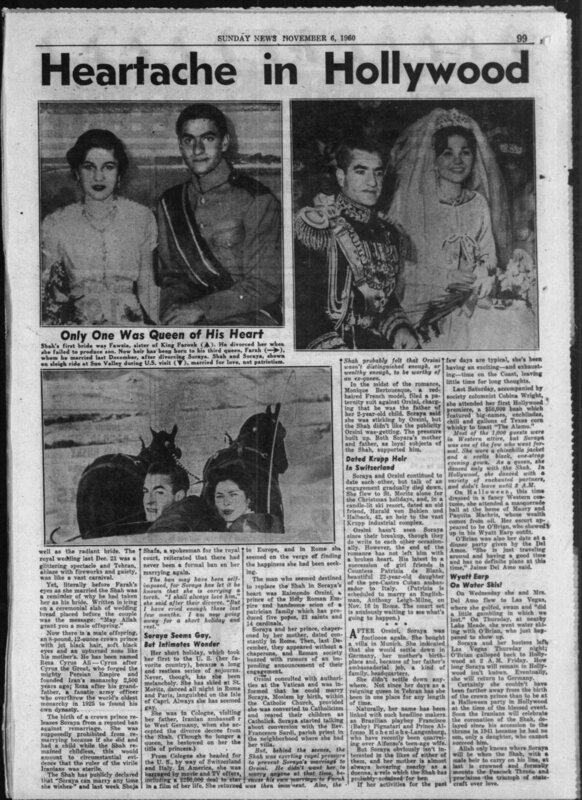 After Allah allegedly told him to divorce his first wife, who had given him a daughter, Pahlavi met and married Soraya in 1951. By 1958, however, she had borne no children, so the Shah presented her with an ultimatum: divorce, or consent to a second (simultaneous) wife. She opted for divorce (which took the "queen" title away). 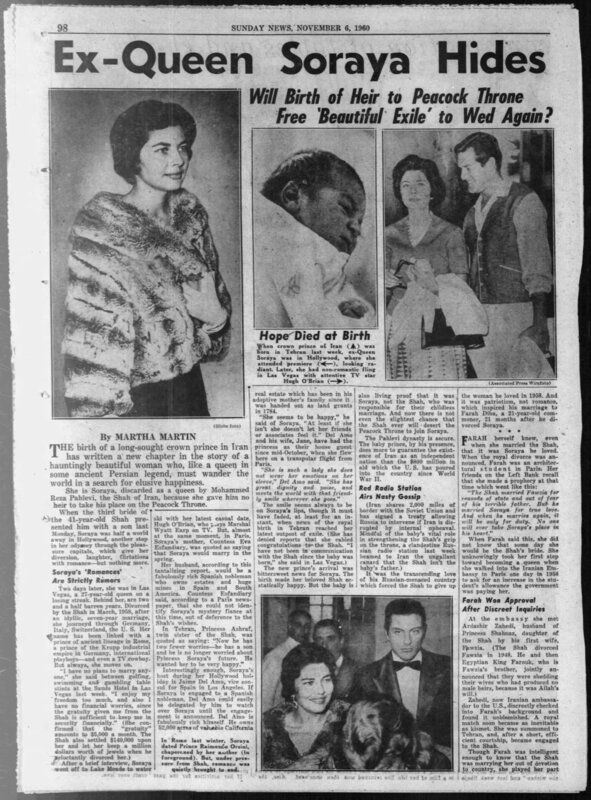 Pahlavi then married his third and last wife, Farah Diba (1938—), who gave him four children. 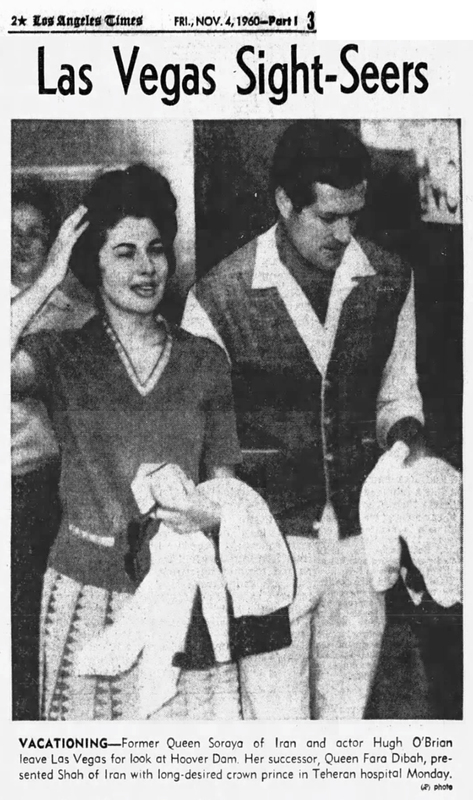 In 1968, Shah Pahlavi was coronated King of Kings (emperor), and his wife, Farah, became empress (which Soraya never was, because the Shah was not yet emperor). By many accounts, Soraya was the Shah's only true love. She never remarried. She died in Paris in 2001. She was 69. Her younger brother and confidante, Bijan, 64, died of loneliness a week later. LW3401: 9600 dpi jpeg from original photograph purchased 2018 by Leon Worden.